World AIDS Day 2011: Cause for Optimism or Alarm? Three weeks ago, Hillary Clinton gave a speech at the National Institutes of Health suggesting that because of recent advances in scientific understanding we could finally envision an AIDS-free generation. Wow, fantastic, the beginning of the end! Could it be? Two nights ago, an optimistic Bono was on the Daily Show talking up the idea of an AIDS-Free Generation. With media accounts of the Global Fund in trouble, something does not compute. What is going on? Yesterday, December 1, was World AIDS Day, and if you tuned in to the live webcast of the ONE Campaign event on YouTube like I did, you witnessed not one but three U.S. presidents – Obama, Bush the younger, and Clinton (plus Bono, Alicia Keys, and Sanjay Gupta!) take part in an event meant to celebrate and defend the role of the United States in the incredible scale-up of AIDS treatment services over the last eight years. President Bush was beamed in by telecast from Tanzania where he and the Tanzanian President made the case that PEPFAR, President Bush’s signature AIDS program (and the single most important positive legacy of his campaign), was a remarkable success. I understand that we are in tight economic times. 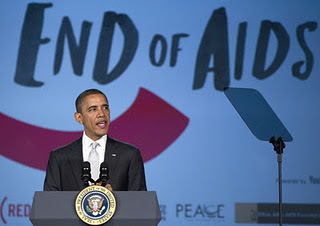 The wealthy nations are going through budgetary struggles… There is nothing more effective than PEPFAR…. The number of people who live today as a result of PEPFAR is staggering. There is no greater priority. And this is something our American citizens must understand. And our government must understand. There is no greater priority than living out the admonition to whom much is given much is required. We are blessed nation the United States of America. And I believe we are required to support effective programs that save lives. President Obama followed his remarks by pledging to increase the number of people on treatment in the developing world from the existing target of 4 million to 6 million by 2013. Again, he talked about how we can finally envision an AIDS-free generation, that the combined efforts to employ male circumcision, prevention of mother to child transmission of AIDS, and early detection and treatment of AIDS could, along with other policies, ensure that the next generation is AIDS-free. Now, at this point, the audience is hooting and clapping, as any dutiful audience is bound to when President Obama at his oratorical best. But, in my classroom where we were streaming the event live, there were a few titters and grumblings. Where is the money going to come from? We know that the Obama budget for foreign aid has many detractors in Congress, and while global health spending is only subject to a modest trim in the House version, it would go down nonetheless. How do you propose to put 2 million more people on treatment when money is going down? The UNAIDS Zero Campaign and Secretary Hillary Clinton’s AIDS-Free Generation calls are excellent goals. But reality dictates that the strategies used to attain those goals, and the tactics deployed both in the field and directed to donors must change radically and immediately. Now, I’ve not had a chance to do the detailed analysis of the President’s plan, but on NPR on the way to the airport, the basic story that I heard was the President aims to do this through existing funds and extracting efficiencies in the program, by lowering drug costs further and by cutting the full costs of treatment, from procurement to delivery. Here, I want to be sympathetic to what the President is trying to do, but at this point, I’m not keen on the man overpromising and then not being able to extract the necessary resources from Congress. I take it this event was a marker to try to defend the Administration’s spending on AIDS, by bringing the full political heft of three presidents, including a Republican, to bear. However, the times being as they are, speeches that talk about preventing the oceans from rising or talking about an AIDS-free generation just don’t quite do it for me any more. The devil is in the details and the politics. Getting to zero: zero deaths, zero infections, zero discrimination against the sick. A goal that is the starting point to turn the page in the fight against AIDS. It ‘is the slogan of World AIDS Day which is celebrated today throughout the world. And tomorrow? The pin will end up in a drawer until next year? Organizations and especially the sick will be back alone in their battle for life? Film, music and entertainment with the media echo chamber is inscribed in nature have the honor and the honor to remind the world that AIDS is not the luxury of silence feature yet.